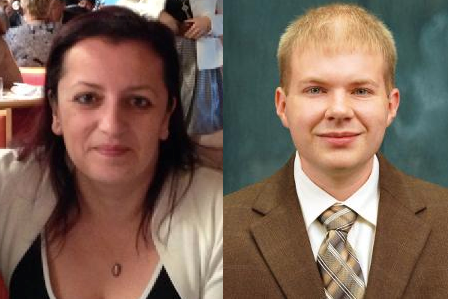 The Ohio State University Board of Trustees recently approved the promotion of Dr. Alessandra Faggian to the rank of Professor and Dr. H. Allen Klaiber to the rank of Associate Professor. Dr. Faggian and Dr. Klaiber are faculty members in Ohio State’s Department of Agricultural, Environmental, and Development Economics (AEDE). Dr. Faggian studies regional and urban economics, demography, labor economics and the economics of education. Her publications cover a wide range of topics including migration, human capital, labor markets, creativity and local innovation and growth. She has co-authored 55 academic publications (of which 38 are in referred journals). Her articles appeared in journals such as Oxford Economics Papers, Cambridge Journal of Economics, Journal of Economic Geography, Feminist Economics, Geoforum, Regional Studies, Papers in Regional Science and the Journal of Regional Science. Her work has been cited over 1,200 times in Google Scholar and almost 450 times in ISI. Her 2005 article published in Regional Studies was ranked 10th among the most-cited articles between 2010 and 2013. She is co-editor of Papers in Regional Science and is on the editorial board of the Journal of Regional Science and Regional Studies, Regional Science. In 2013, Dr. Faggian was appointed by the European Commission as one five jurors to select the European Capital of Innovation 2014 (iCapital Award). In 2010, she was elected councillor-at-large of the Regional Science Association International (RSAI). In 2012, she also became a member of the Board of Directors of the Western Regional Science Association (WRSA) and she was elected councillor-at-large for the North American Regional Science Council (NARSC). Dr. Klaiber’s research interests reside in the fields of environmental economics, applied econometrics, nonmarket valuation, and energy. His work focuses on linking environmental services to human behavior using economic theory to develop specific hypotheses describing what can be learned from individual choices occurring over space and time. Much of his research focuses on the valuation of environmental amenities using data from housing markets. He has recently studied topics ranging from the impacts of shale gas exploration on nearby property values to the role of open space preservation in reducing urban heat island effects in large cities. Dr. Klaiber also serves as an associate editor for the American Journal of Agricultural Economics and has recent publications in The Review of Economics and Statistics, Journal of Environmental Economics and Management, and Land Economics. Congratulations to these outstanding AEDE faculty members!